Souping includes more than 80 deliciously healthy recipes for nutrition-packed meals. These meals are created by preparing and combining everyday ingredients in your blender to create fresh, nutrient-rich soups. Not only can Souping provide additional nutrients and hydration on a daily basis, it can also be used as part of a cleanse program. 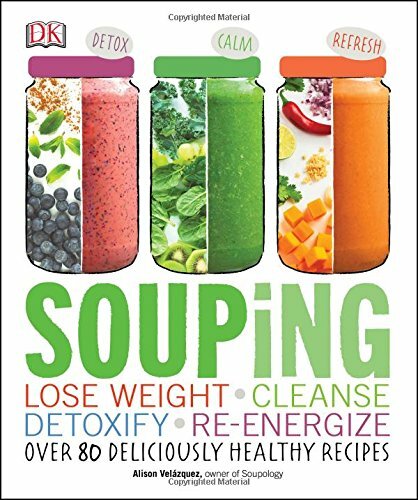 For my purposes, I chose to request this book to review because I am very interested in creating soups to add additional nutrients to my diet in a healthy and simple way. To be able to eat in a mindful way – quickly – is my goal and Souping is going to teach me the recipes I need to do this! The initial section of Souping introduces us to the differences between Souping and Juicing, the health benefits of Souping, the essential ingredients you will want to have on-hand in your pantry and freezer and the tools and equipment you will need to make your soups. We also learn about the differences between Hot Soups, Cold Soups, Broths and Consommes. Souping is filled with beautiful full-page color photographs, clearly written recipes with Prep & Cook Time, Quantity & Serving Sizes and Maximum Storage Times. Nutritional information, per serving, is also included for each recipe. Many of the recipes also include options/substitutions for one of the ingredients. The Author recommends cooking your soup in batches and storing them in single-serving portions for ease of consumption. Recommendations have also been given for the types of containers you may wish to purchase to store your soup safely inside. The 10-Different Cleanses included are explained clearly and in a step-by-step manner to make it easy to achieve your chosen cleanse goals. You will find a Shopping List with the Fridge/Freezer and Pantry ingredients you will need to have on-hand to prepare your soups. Preparation for the Cleanse instructions are also provided. This includes 1 week before, 2 days before and 1 day before tasks for you to complete. Typical preparation tasks include the soups you need to prepare in advance and items you may need to temporarily eliminate from your diet – items such as processed foods and sugars or poultry, meat and dairy…as 2 examples. During the Cleanse instructions outline your daily menu and portion sizes for breakfast, snack, lunch, snack, dinner, dessert and possible alternatives for some of the meals. Listed here you will also find Cleanse Boosters to include such as drinking alkalized water between meals, daily exercises recommended and even different treatments (like colonic treatments). The final five sections of Souping include the recipes. There are a number of recipes I want to try from Souping and the first two I plan to make are Beet Soup with Fennel and Carrot & Fennel Soup. Hopefully this will be one New Year’s Resolution I can successfully implement in our home – who knows maybe my very picky eaters will eat more veggies too! You can purchase your own copy of Souping, Alison Velázquez at Amazon.